Geoff Collins and Georgia Tech's new coaches have to get creative to transform what was a highly specialized offense under Paul Johnson into the attack they want. Plus, notes from spring practice around the country, a Game of Thrones–themed Random Ranking and the rest of this week's Punt, Pass & Pork. ATLANTA — It’s 6:58 a.m. and Jeezy is bumping in Georgia Tech’s defensive meeting room. The meeting starts in two minutes. The tunes began playing 18 minutes ago. At some business conferences, they’ll plonk on a xylophone to let attendees know a session is about to begin. In a Geoff Collins program, you know it’s time to move when the bass drops. Following the THOUGHT OF THE DAY WITH UR BOI—an inspirational message from a player; that player this day is safety Tre Swilling, the son of former Georgia Tech great Pat Swilling—defensive coordinator Andrew Thacker begins constructively criticizing the defense’s performance from practice two days earlier. Thacker’s constructive criticism includes a lot of questions. But he expects answers from everyone in the room, not only the affected position group. So when common sense and the down-and-distance eliminate a particular stunt as a possible call, he wants to hear everyone—not just the linemen and linebackers—offer the correct call. Collins, who took over the program in December following the retirement of Paul Johnson, started having meetings like this one when he was the defensive coordinator at Albright College in the late 1990s. He was the only defensive coach then, so he didn’t have time to break the information into positional chunks. But when he returned to schools that had more manpower, he realized this helped everyone understand the defense more holistically. Afterward, the group splits up into individual position groups for a shorter meeting. “We want them to understand how everything works conceptually,” Collins says. “Now, when we break this meeting—go drill down on the details on your part.” When Collins became a head coach for the first time prior to the 2017 season at Temple, he had the offense meet this way as well. This is probably more necessary at Georgia Tech because the philosophy shift is more radical than any other program that underwent a coaching change this offseason. Johnson ran a triple option offense, which requires a very specific type of quarterback and specific body types along the offensive line. That offense also uses no slot receivers or tight ends. Meanwhile, defensive linemen are told during recruiting that they’ll get cut blocked every day at practice if they sign with the option team. Even if this isn’t true, it makes it difficult to sign defensive linemen of prototypical size. You will see the triple option besmirched in other places, but not here. It is a fine offense, and it worked well at Georgia Tech. But the Yellow Jackets are trying to win a little more conventionally now, and that’s fine too. The shift, however, does present some unique challenges to the incoming staff. You’ve already read about how Collins is trying to rebrand Georgia Tech, but this part—the actual football piece—is more important than that part. Because if the Yellow Jackets flop on the field, all the Waffle House cups, ATL hats and 404 sleeves in the world won’t help. That’s why Collins and the staff have spent the spring mixing and matching. What they do offensively will be drastically different, but the defense has changed as well. So they’ve got to figure out what every player does best. When you inherit 13 backs and zero tight ends, you have to try to make the numbers work somehow. Collins told his coaches early that Georgia Tech probably won’t run exactly what Temple ran last year on offense or defense. Once this personnel evaluation period wraps, the coaches can build what the 2019 Yellow Jackets will run. Offensive line coach Brent Key might suggest some things that worked at Alabama last year. Offensive coordinator Dave Patenaude might fall back on some schemes that worked in his final season at Coastal Carolina (2016), when the Chanticleers went 10-2 despite having to play six different quarterbacks because of injuries. That team was supposed to run a pass-first offense, but its final numbers (3,052 rushing yards, 5.2 yards per carry, 1,600 passing yards, 7.6 yards per attempt) looked closer to something one of Johnson’s teams at Georgia Tech or Navy might have posted. “Everything is based on players,” Collins says. “It’s not based on scheme. It’s not based on system.” Besides, they couldn’t jam the Yellow Jackets into a system if they wanted to. “We can’t line up and run a lot of 12 personnel [one back, two tight ends] stuff like we did at Temple,” Collins says. “We only have two tight ends on the roster.” (One is a graduate transfer and one is a freshman.) But that doesn’t mean the Yellow Jackets can’t line up in the shotgun and spread some of those 13 backs—some of whom are now former running backs and current slot receivers—across the width of the field. Don’t be shocked if Patenaude embraces what the quarterbacks he inherited do well. Nearly every offense run in college football today includes some option elements. They just get run out of the shotgun, often without a fullback. There will be aspects of the new offense that quarterbacks Oliver and Lucas Johnson are completely comfortable with, and it would make sense to steer into what the inherited players do well. Also don’t be surprised if Jordan Yates—an undersized dual-threat QB who led Milton (Ga.) High to a Class 7A state title last season—gets a shot at the position when he arrives this summer. The question on The Flats is whether the Yellow Jackets have more versatile athletes than anyone thought. Collins plans to keep mixing and matching until he and his staff find the lineup that works best. Whether that looks anything like Collins’s Temple team looked last year is irrelevant. All that matters is getting the most out of the players dancing their way into the meeting rooms as Jeezy thumps. Game of Thrones returned after a loooooooooong hiatus. I won’t spoil anything for you if you haven’t been able to watch yet. Instead, let’s rank those who have served as Hand of the King (or Queen) since the series began. The best Hand the Baratheon/Lannister crew had wasn’t even really the Hand. He was the acting Hand while his father Tywin led troops in the Riverlands. All Tyrion did was keep Joffrey from burning down King’s Landing with Wildfire. He then saved everyone’s bacon in the Battle of the Blackwater only to be punted back down the organizational chart when Tywin returned. Now Tyrion serves as the Hand of a queen who has dragons. The slickest political operative in Westeros probably would have remained in his position had he not messed with his son’s lady and then retired to the commode. Sure, he’s insane. But the woman he works for probably is, too. Kevan managed to get himself torched by his niece Cersei, who used Wildfire to massacre everyone in the Great Sept of Baelor following the trial of Loras Tyrell. Way to stay informed, Kevan. The story begins with Ned Stark leaving Winterfell for King’s Landing to replace the late Jon Arryn as King Robert Baratheon’s Hand. Let’s be real: Ned was a terrible Hand. He failed to properly identify any of the threats to the administration he served. He also failed to do his real job—to keep Robert’s various appetites from getting him killed. But at least he found Gendry before he lost his head. 1. I’m not sure exactly what the marriage of Les Miles and Kansas will bring, but if nothing else, it already has given us video of the Mad Hatter on stage with Rick Ross—and that’s enough. 2. SI’s Joan Niesen visited quarterback Kelly Bryant at Missouri to learn why the Clemson graduate transfer stayed when the NCAA hit his new program hard. 3. Ohio State punter Drue Chrisman proposed to girlfriend Avery Eliason following the Buckeyes’ spring game. Not the first spring game proposal we've seen, and certainly not the last. I know I said no Game of Thrones spoilers, but how on earth is Samwell Tarly so broken up when he learns that his father Randall and younger brother Dickon—go ahead and laugh; everyone else has—got executed by Daenerys for refusing to bend the knee? I realize Sam as a character probably has more empathy in him than the rest of the characters combined, but his family treated him like garbage and then sent him off to die at Castle Black. Besides, Dickon—go ahead and laugh again—couldn’t stick around for Season 8. Tom Hopper was busy looking swole on Season 1 of The Umbrella Academy. I’m glad the Minneapolis coffeehouse I tried to visit last week had a—what’s the word?—unorthodox business plan. I walked past the renovated Victorian cottage that houses Uncommon Grounds on the morning of the basketball national title game and thought, “That looks like a wonderful place to enjoy a cup of coffee.” Unfortunately, I’d made the mistake of trying to buy coffee in the morning from this particular establishment. The place is open from 2 p.m. to 11 p.m. on weekdays and 11 a.m. to 11 p.m. on weekends, meaning it serves coffee—a drink most often consumed in the morning—for exactly two morning hours a week. This is akin to opening a bar from 6 a.m. to 2 p.m. or a pizzeria that only serves during breakfast hours. Sure, you’ll make some money. But you probably won’t maximize your revenue. But different strokes for different folks. I’m sure the proprietors of that place have a great reason for slinging coffee after prime coffee-slinging hours. The good news for me is that I didn’t waste my money there. Instead, I kept walking and found a Dogwood Coffee Co.
1) You’ll truly understand why someone would pay $5 for a coffee drink. 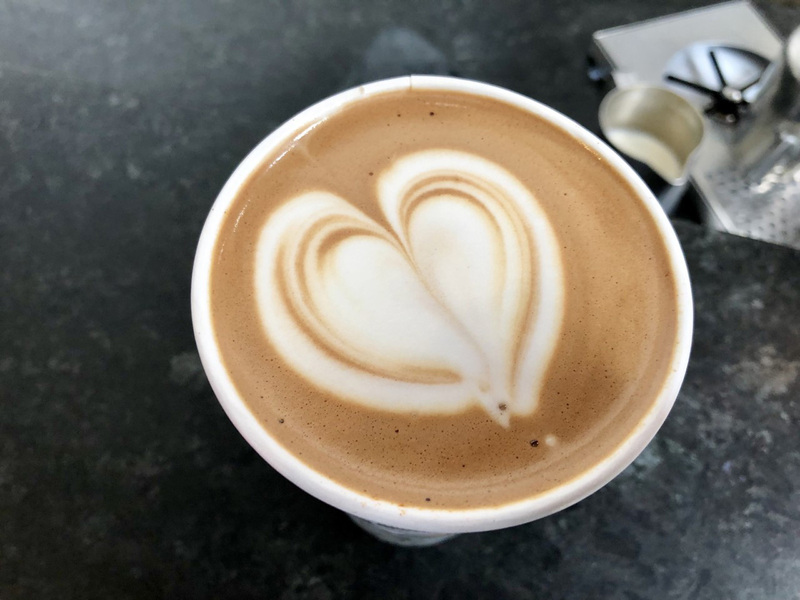 2) You’ll never again understand why anyone would pay $5 for a coffee drink from Starbucks, Caribou Coffee or any of the other giant chains that overcharge for boring steamed milk and espresso that doesn’t taste anywhere near like it does at Dogwood. Dogwood charges about what those places charge, but the product is vastly superior. I had a Heat Wave Mocha. If this were sold near my home, it would be the only non-drip coffee product I’d ever buy. The concept isn’t complicated. Have you had spicy Mexican chocolate? It’s the glorious marriage of cocoa nibs, cinnamon, chile powder and cayenne pepper. Now imagine that mixed with espresso and steamed milk. Again, it’s not complicated. It’s merely executed perfectly, and it’s exactly as amazing as it sounds. Of course, the entire place is designed to separate hipsters from their money. They sell wool baseball caps with the company logo for $50. But that Heat Wave is worth every penny, and it’s an incredible way to start the day. Or end it—just in case you still want to visit Dogwood even after that other place finally opens.